Crab Rangoon has been a favorite appetizer of Wesley’s for as long as I can remember. Every time we ordered Chinese takeout, he insisted on ordering crab rangoon in addition to whatever else we were ordering. I would try them, and I thought they were good. Although, more times than not, they were just okay. But every now and then, they would be incredible. I finally decided to make my own version. And I must say…they are INCREDIBLE! I played around with the filling until it was just right. I had to resist using too much crab, because if I did, it was very ‘crabby’ tasting, and lost the classic filling texture. Many takeout Chinese, or Thai, joints, I’m convinced use imitation crab meat. And honestly, that’s okay. If you’re serving these at a party, you may have some picky eaters who don’t like the taste of real crab. Imitation is just that, imitation, but it still gives a nice texture. I love crab, so I had to go with lump crab meat, which is a little more pricy, but you can certainly go with regular canned crab meat, which is called backfin crab meat, and it’s smaller chunks. 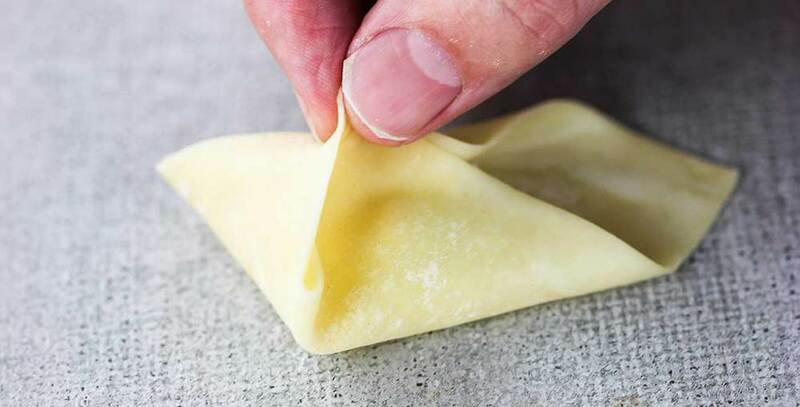 Forming the crab rangoon into their parcel-like shapes is actually quite simple. 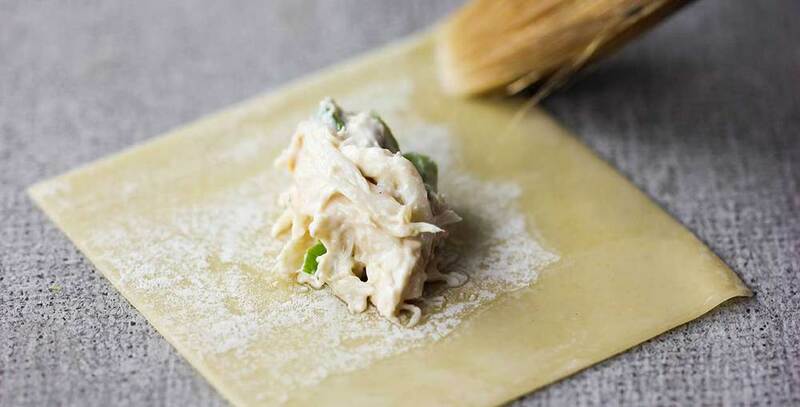 You start with a square wonton wrapper and place 1 teaspoon of the filling in the center of the wrapper. Now, use a small brush (or your index finger) to wet the edges with water (this will help the edges to adhere to one another). See if you can find a helper at this point so you can form the crab rangoon twice as fast as you would if you were forming them alone. Plus…it’s fun! Now, bring the top and bottom corners together and gently seal with your finger. Have you found a helper yet? How about a glass of wine? Then, bring one of the side corners in, and pinch to form a seal. Try to pinch tight enough to remove excess air inside the rangoon. Repeat with the other side, pinching all over to form a little pouch that looks like a parcel package. Once again, finding a crab rangoon helper makes this process go much quicker. And a glass of wine. The Loon loved forming these little parcels of yumminess because he knew he was about to eat them up. 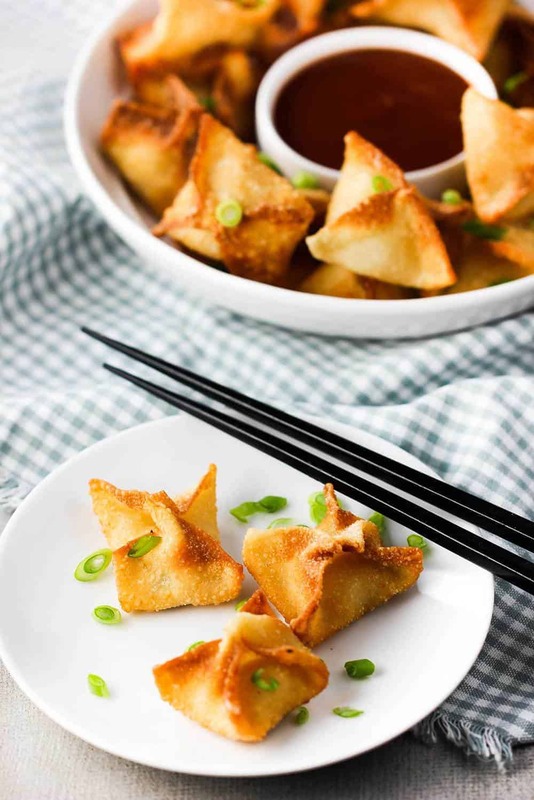 Traditionally crab rangoon are fried to crispy perfection, but they can also be baked to perfection, too. If baking, bring your oven to 375°F. Then spray the tops of the rangoon parcels with cooking spray. Place them on a parchment-lined baking sheet and then bake them for about 11 minutes, or until lightly browned. We decided to fry them, and they only took about 3 to 4 minutes. Make sure your oil is at 350°F. If it’s too hot, they will brown too quickly and not heat the filling enough. 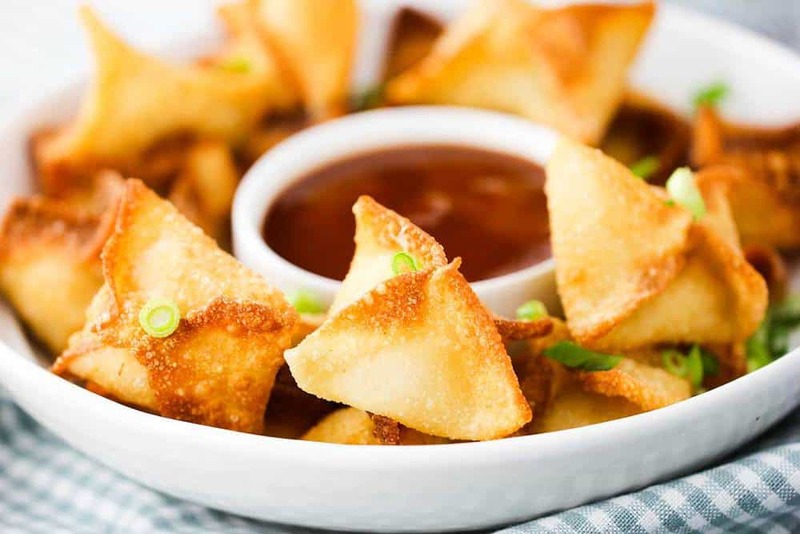 Since cheese, especially cream cheese, is seldom found in Asian cooking, it is unlikely crab rangoon originated in China or Thailand. Although their origins are sketchy, at best, they have found a permanent home on Chinese and Thai menus across the globe. And now, you can see how easy they are to make at home! 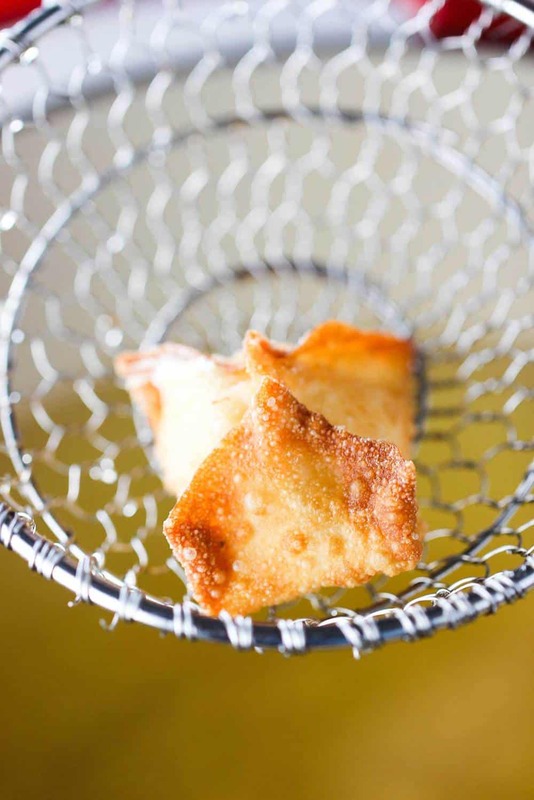 Crab rangoon can be assembled a couple hours in advance, up to frying or baking them. Just keep them in an air-tight container. We love serving them with my delicious and super easy Sweet and Sour Sauce (recipe included). These are perfect for a party and are always a huge hit! 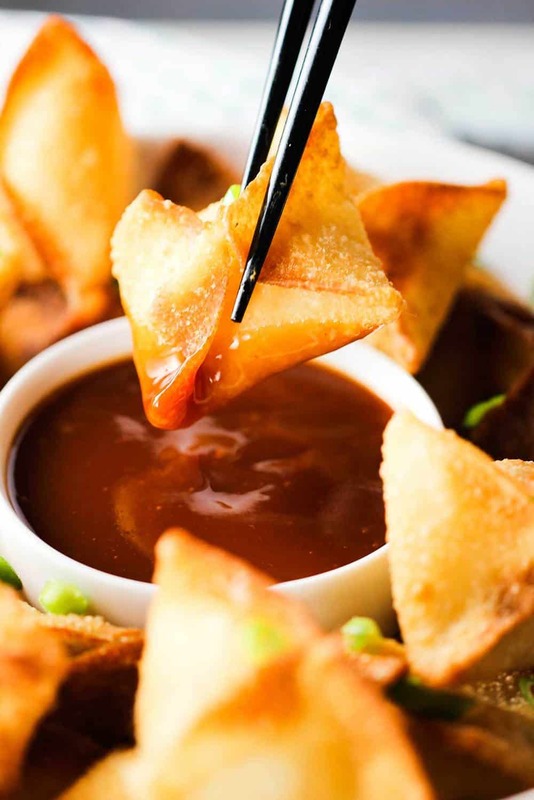 Crab Rangoon is a staple on Chinese and Thai menus. And now, you can make these delectable appetizers at home. So delicious and so easy. They are always a crowd favorite when we serve these at a party. You can assemble them up to 2 or 3 hours ahead of time (keep in airtight container) and the fry or bake just before serving! Yum! 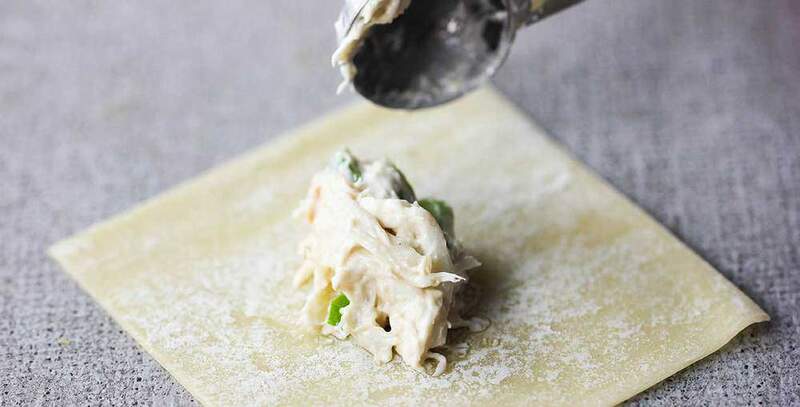 Mix all ingredients together with a small whisk, or fork, until fully combined. Set aside. Beat cream cheese in medium bowl with hand mixer or wooden spoon until light and fluffy. 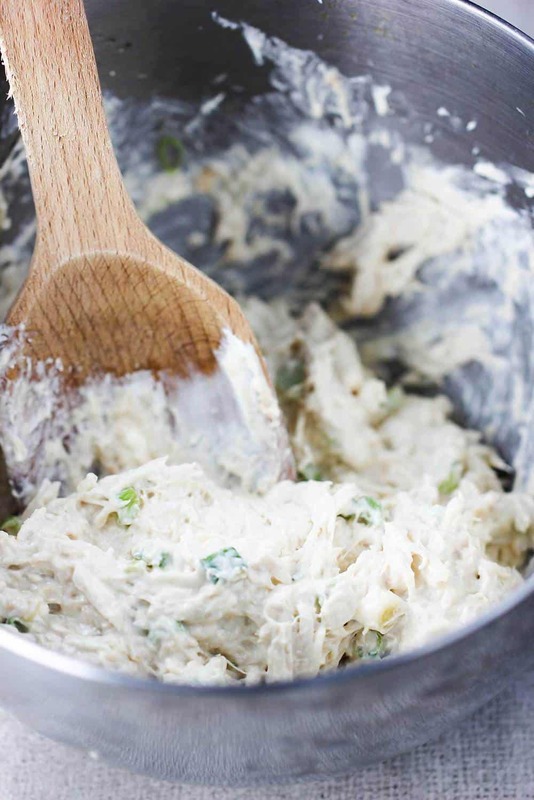 To the cream cheese, stir in the crab meat, garlic, scallions Worcestershire sauce, sesame oil and soy sauce. 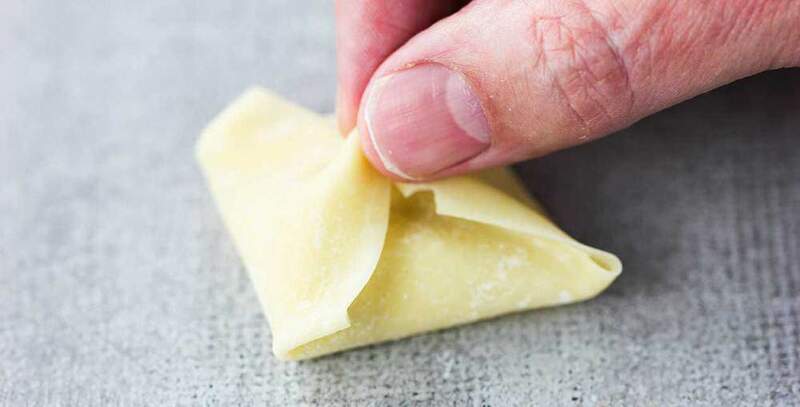 Place a wonton wrapper on a clean surface. Add 1 teaspoon of filling in the center of the wrapper. Use a brush to apply water around the edges. Pull the top and bottom corners together and seal with your fingers. Bring one side together, pinching to remove excess air and seal the edges. Repeat with the other side. 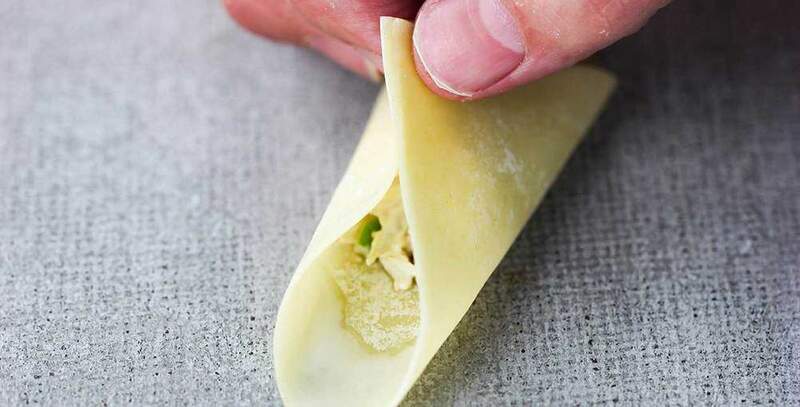 Set aside and repeat with remaining wonton wrappers. You should have approx. 44 crab rangoon. Meanwhile, heat 2 inches of oil in a deep, heavy pot (or your deep fryer) to 350°F. Fry the wontons in batches 1 to 2 minutes per side, or until golden brown. Remove with slotted spoon, drain on paper towels. Serve at once with Sweet and Sour Sauce (or your own favorite dipping sauce). Enjoy! Love your show. It was a joy to view. Laughter is truly the best medicine. Thanks so much!!!! I recently started using an air fryer. Any suggestions for these or stick to traditional deep frying?